It would have to be Waikato University putting up such a display of preciousness. They want 'Waikato' pronounced properly. Not Why Cat O. It has to be Why Car Tore or Why Cut Or. What stupidity. People can and will pronounce words how they want to. We all know what we are talking about. The fact that Maori words have to be turned into recognisable English words so we can pronounce them 'properly' makes the exercise even sillier. These demands for correctness just make people self-conscious about using Maori words and they are more likely to avoid them. More populous countries have dialects, England being a prime example. There is no pressure for a Yorkshireman to speak his vowels like a Cornishman. The difference is important and interesting. Anyway, I thought we embraced 'multiculturalism' in this country. Doesn't that include accepting various pronunciations? It's OK for different tribes to have different pronunciations but not Pakeha. What bull. Who is advising Ruth Dyson? 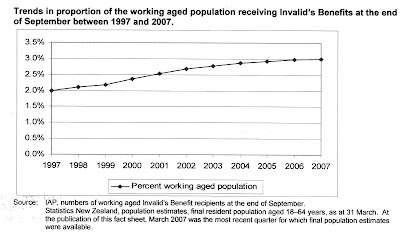 Judith Collins: Why is it that in the period of so-called record low unemployment, almost 130,000 people—5 percent of the *working-age population—are too sick to work, which is a 50 percent increase since 1999 and is yet another record high? Madam SPEAKER: It is difficult to hear. Hon RUTH DYSON: —is 2.5 percent, which is a total of only 3.9 percent. Rt Hon Winston Peters: I raise a point of order, Madam Speaker. We could not hear any part of that answer whatsoever. Madam SPEAKER: I thank the member. I will ask the Minister to repeat her answer. Hon RUTH DYSON: My answer advised the member who asked the supplementary question to be a little more robust in the accuracy of the information she provides in those questions. 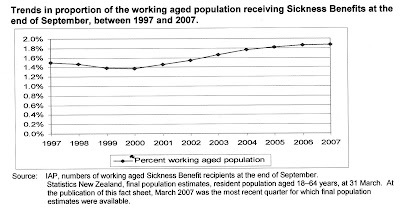 The number of people of working age on a sickness benefit is 1.5 percent of the total working-age population, and on an invalids benefit it is 2.4 percent. If you think I am quibbling 1% of the working age population, using MSD definition of 18-64 years of age, is around 25,000 people. Rick Giles - Silent Running - is home. After just over five weeks in a United States prison for having an expired tourist visa, Canterbury man Rick Giles has been deported home. The 28-year-old arrived back on Sunday relieved to be free, but disappointed his overseas travel ended with him being put behind bars. "I,ve been saving up for my OE for a long time. I was really enjoying myself and it has come to a premature end," he said. Last Wednesday, The Star revealed Mr Giles had been detained near Detroit under strict US immigration laws after officials found his tourist visa had expired by six days. He was returning to Canada when he was nabbed. He said he had mistakenly believed his visa was still valid. Speaking to The Star from his parents' home in Clarkville near Kaiapoi yesterday, he said conditions at the William Dickerson Detention Facility were not too oppressive. He was held from September 27 to November 4. However, he said the prison officers were "really mean people." "They would yell at you as a means to keep you in control," he said. "There was a serious absence of privacy. There were about 60 guys in a great big room. Shaving and cutting your nails didn't happen. "If you asked for nail clippers you didn't know what they (the guards) were going to do," he said. Mr Giles said he had a social insurance card, a bank account and some job prospects waiting for him in Canada, and never imagined he would be imprisoned in the US for that length of time. "I started out in disbelief and amused to end up in a US jail. But after a week that went away," he said. "I felt angry and closed in & that lasted the rest of my time there." "I tried to get in touch with the (New Zealand) embassy, they couldn't do anything. "It was very frustrating," he said. He said he had been lucky not to have received a criminal record, as he had heard of others in similar situations that had. "Canada was a stones throw away, about 400m. But instead, they shipped me around the world," he said. He said it was nice to be back in his own clothes and be able to tie his shoes. Rodney Hide debates banning fireworks with Marion Hobbs. Now why couldn't John Key bring himself to say this? Of course Hide is right. This issue is about individual freedom and personal responsibility. That a few fools out there are misusing fireworks is no reason to prohibit everyone's access to them. As he says, on that basis why not ban matches, barbecues and camp fires? Where is this compulsion to remove risk going to end? Get thee to thy GP now! * Obesity: Waist circumference and Body Mass Index (BMI) every two years. * Blood pressure: two-yearly between 18 and 50, and every year for age 50 and over. * Cholesterol: five-yearly from age 45. * Fasting sugar for diabetes (blood glucose): every three years from age 55. * Urine test for protein: to test for kidney failure, every 12 months from age 50. * Skin checks for skin cancer: for high-risk skin every year. * Bowel screen for bowel cancer (faecal test for blood): every two years over 50 years. * Men should discuss prostate checks with their GP from age 50. * Osteoporosis risk assessment and bone densitometry for men at risk. Oh really. The push to extend Paid Parental Leave just got sillier. UnitedFuture say that as research shows breastfeeding increases IQ, mothers should be paid to stay home and do just that. I wonder if they are going to demand that breastfeeding become a requirement for receiving existing PPL? Or that receiving the DPB makes breastfeeding mandatory? And for how long? Well, as you brought it up UF, what about the heretical idea that those most able (financially and emotionally) to raise children might be the ones with higher IQs and a mother's IQ is an important factor in determining the child's? It's not an implausible idea. Of course nobody dare say so. Except that mad professor who thought we should put contraceptives in the water supply so people who wanted to become parents would need to take a positive action instead of just drifting into it with no thought as to who would pick up the tab, resulting in a bias towards the uneducated. The best family policies should be the same as the best policies for individuals - low flat tax, choice in education and tax rebates for health insurance. John Key - "It's inevitable"
I have only caught snippets of the firework debate on talkback radio, but the strong impression I get is fireworks are polarising people. The PM's edict that they would be banned from sale to the public if people didn't behave (and her accompanying remarks about Khandahar) have got right up people's noses. You can't overstate the effect seemingly small matters can sometimes have. Banning fireworks is one of those camel's back issues which stirs up disproportionate resentment because it is just one more instance of being dictated to. "....but I'm afraid it's inevitable." WHAT??? You want to be the Prime Minister of this country John. You tell us what you really think, tell us that banning fun has gone too far and that we are all punished for the sake of few bad eggs and then, that you are going to continue to let it happen. Why not say it won't happen under any government I am leading? What's wrong with you? Sitting on the frigging fence all the time. Have you noticed that the Death Notices section of the newspaper has decreasingly become a place to notify a death to the public and increasingly a place to send messages to the dead? A feature of the secular world no doubt. Similarly funerals seem to be an opportunity to make lavish displays of caring after the fact with names emblazoned on garments and probably newly on the skin under them. Whatever. None of which has much to do with what I wanted to comment on. A Lower Hutt man died on Saturday morning. There was a small piece in the DomPost and numerous death notices. According to the link he was assaulted by a woman with a blunt instrument. Now one can only assume she was his partner. That being the case, where is the outcry about violence towards men? Why haven't the media dug up the statistics about how many women assault men each year? Where are the many stopping violence networks now? Personally I am pleased that the case has remained low key. It's a tragedy for his family and should be left at that. But I can't help reflecting on the resounding absence of the anti-violence advocates when the boot is on the other foot. Last year I was certain Poprock would win and barely looked at the rest of the field. In any event it came second. This year I am less certain but going for Master O'Reilly. I backed him in the Cauldfield when he won so will stick with him. But as my track record is coming second I will throw in a few more. In a half boxed trifecta I'll include Princess Coup (go Noel Harris at 52 years-old), Tungsten Strike who has been running well over distance at Goodwood carrying much higher weights and finally a NZ roughie, Dolphin Jo, with good dead track form, has placed over the two miles and is ridden by one of only 2 female jockeys, Clare Lindop. Good luck if you are having a bet. CLS has a very thought-provoking post about the odious Phelps family who are thanking god for dead soldiers at the funerals of soldiers killed in Iraq because it is god's punishment for the US not stoning homosexuals to death. The post is a discussion of the weakness of libertarian principals in allowing free speech carte blanche. One soldier's family sued this sick group and a jury have found for the family under the offence of causing emotional distress. I don’t want emotional distress to be used easily to stifle the free speech of others. It is too easily abused. Anyone can claim distress and this would hold rights ransom to the emotionally weakest member of a community. There is no hard and fast definition of what constitutes 'emotional distress'. But left to a jury, if you believe the jury system is the best justice process we have (like democracy as a governance process - not perfect but the best we have), then you may be grudgingly happy for the right to free speech to be tempered with the possibility of a group of your peers subsequently finding the content caused 'emotional distress' and fining the offenders. The offenders ability to speak is not taken away but they risk paying a price. This may curtail the likes of this very ugly group. Certainly this is not a risk-free answer (to either the individual or society) but again it may be the best available. We live in a dynamic and evolving world and what works today may not work tomorrow. That's life. And I don't mean that flippantly. Smokefree Coalition director Mark Peck said the survey showed the need to raise taxes on roll-your-owns. Tax is based on the weight of tobacco. Roll-your-own cigarettes average only half the weight of tobacco in ready-made cigarettes. Mr Peck said roll-your-owns' share of the tobacco market had risen as a result from 30 per cent to 48-49 per cent, while ready-made cigarettes had dropped to 43-44 per cent, with pipe smoking accounting for the balance. In my experience, most low-income people smoke roll your owns. I don't mind that they do because being around rollies is far less unpleasant than being around tailor-mades. Puny things that emit little smoke when they are actually alight. Much of the time they are not. But they seem to satisfy the craving for tobacco. But here we go again. An ex-Labour MP wants to punish the poor - for their own good you understand. "You can't have your pleasures, only the rich, the elite can." Shades of JIm Anderton's sherry debacle. The result will be a burgeoning black market, more exposure to other drugs and more crime. As Will De Clene pointed out yesterday and Bruce Robertson is echoing in the Herald, people won't be told what to do when it comes to personal habits. They will rebel. Governments should just get over it and start thinking about how a little less economic bullying and nagging might produce a better result. Did you know that if you consume half a bottle of wine with dinner over a period of 8 years you could damage your brain?? Even social drinking puts you at risk of brain damage! 785,000 New Zealanders are at risk!! There is going to be a crisis in the health system!!! Breakfast telly are reporting, "Shocking health findings"!! "It's critical New Zealand wakes up to an issue that will become a major crisis in the next 20 years, with health services being swamped with people with alcohol-related brain damage." In 1986 there was a 'crisis' too. It was reported that, "380,000 people in New Zealand have had psychiatrically classifiable alcohol abuse and/or alcohol dependence at some time in their lives. An additional 17 percent (more than 340.000 New Zealanders) were problem drinkers at some time in their lives," and, " In New Zealand problem drinking is a major public health issue. " No doubt health services would be swamped in the next twenty years! I confess to some conflict over the Mallard business. On one hand I can see where Deborah Coddington is coming from; on the other, the breathless hypocrisy of a government that constantly condemns the use of physical violence in any situation not condemning Mallard is too much to swallow. So I see where Rodney is coming from. And he is getting support from another section. I have a couple friends who are not middle-class,not materially well-off or well-educated but usually on to what is happening in the news. On Friday they took me to the pub to play pool and drink raspberry and lemonade. It was a treat because it was my birthday and I love to play pool. When I arrived at their home one said to me, that Rodney Hide guy is the only one making a fuss about Mallard. I wondered where the conversation would go next. Would he be a jerk or a good guy? He's right, I was told. Why shouldn't Mallard be treated the same way as anybody else? Why should he get away with it just because he has friends in high places? Shouldn't the law be "one size fits all" it was put to me? I couldn't argue. But it's par for the course for Labour. Sticking it to the people they purport to be the champions of. The strong steak of anti-authoritarianism that runs among the disaffected 'poor' is only fed by the blatant one-rule-for-you and one-rule-for-meism that is the hallmark of socialists.